As we work on getting back to a regular schedule of MND (Monday Night Dinners) New Person gave us a stick to your ribs slow cooker dish. It was rich and tasty and everything a crock pot meal should be. I (FreeFoodBaby) had been out sailing all day so I was super happy for creamy potatoes and cheese. New Person made a few adjustments to the Crockpot scalloped potatoes with ham. She upped the amount of potatoes to 4 pounds (there are 5 of us these days); milk instead of water; and 2 tins cream of mushroom and garlic condensed soup. Ours was cooked 4-5 hours on high. The richness of our cheesy potatoes and ham was beautifully balanced with steamed green beans. Once again we all ate more than we intended and left New Person with very little in the way of leftovers. We were so excited to eat this week’s deliciousness I don’t think we took any pictures. But there is a pretty good one on the recipe if you follow the link. I was given some home smoked salmon a while back, but warned that it had turned out a bit salty. 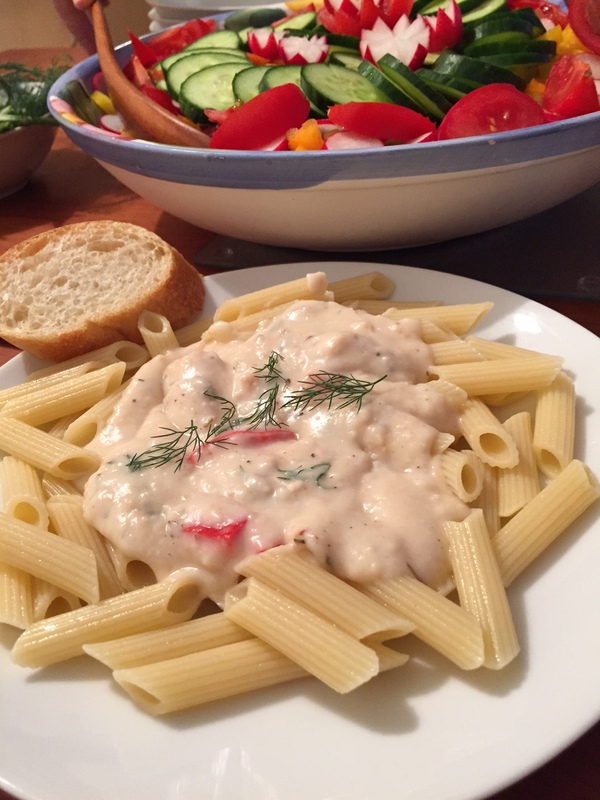 So I kept it in my freezer until I was inspired to make a cream sauce with it. I figured with the salty salmon I wouldn’t have to add any salt myself. In regular cooking, I’m actually not that big a fan of white sauce so I brought in Guest Chef to help me out. We kept it gluten free by making our rue with corn starch. This also led to a very thick sauce in the end. Our salad was a family favourite with lettuce on the bottom and sliced veg in colourful pattern on top. Guest Chef was surprised that we were only making one sauce so with all his extra time he made homemade sauce’n’cake. 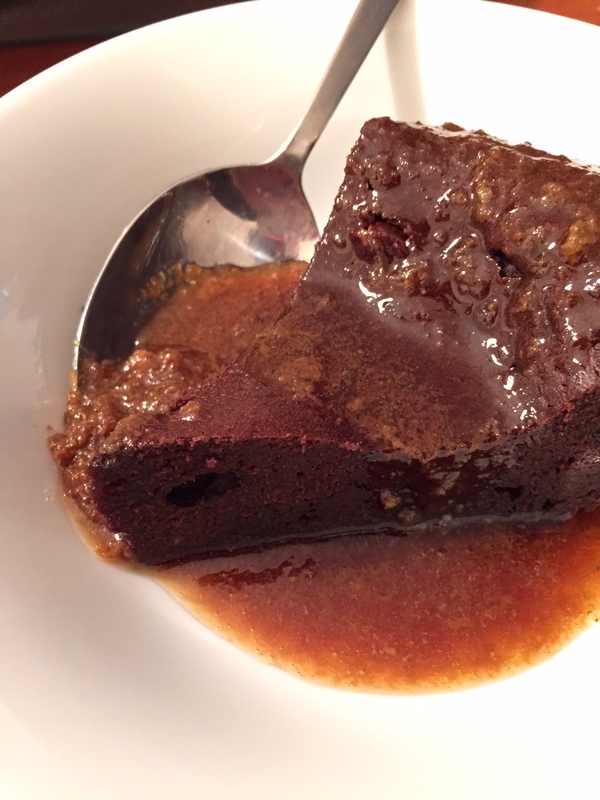 His was chocolate with a caramel sauce. It was made bacause he has heard me lament the fact I couldn’t find Dr. Oetker’s sauce’n’cake mix at my local grocery store anymore. I thought it was because my local store stopped carrying Dr. Oetker but a Google search revealed they actually stopped producing sauce’n’cake mix in 2012. Shocking that it has been that long since we had it! The whole crew plus Guest Chef came out for dinner at NP’s house. Guest Chef was just here to eat this week since we were belatedly celebrating his birthday. NP made up the taco spiced ground beef and then threw it in the crock pot to make sure it was stewed all through with flavour. 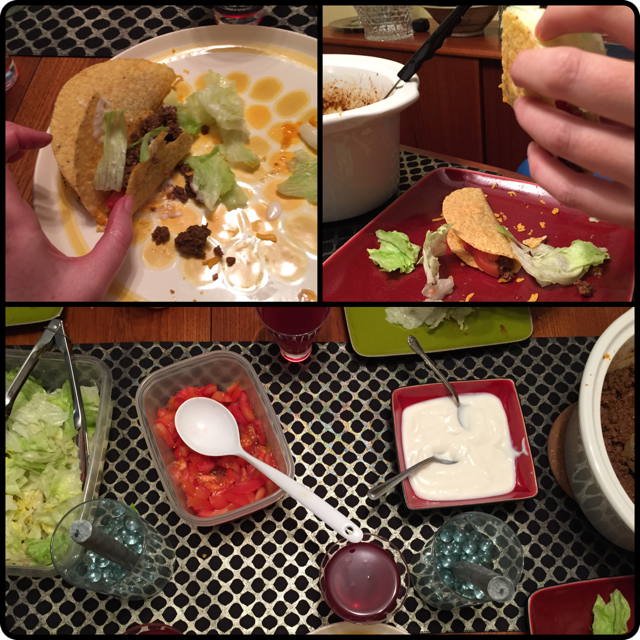 There were diced tomatoes, grated cheese, lettuce, sour cream and 4 hard shells each. We ate them all and didn’t leave much behind for the clean-up. When we sat down to eat, it was decided that this was the perfect meal for our day even though only NP had thought to make it. As we were cleaning up NP found the jar of Salsa she had bought for us, but we never even missed it. We have been a very busy group of people lately and I (FFB) managed to wrangle our dinner group together on a Monday night. For a group that calls ourselves the Monday Night Dinner Crowd this is a very rare occurrence. I managed to be at my grocery store the day they mark down all the older meats in the case and snagged an $18 pork roast for $9 and this became the basis for my menu. This was my first attempt at purposefully making pulled meat (see Bring the bowl..). Using the crock pot and the tenderizing power of ginger ale it turned out really well. The recipe was pretty simple, put thawed pork in the crock pot add about 1 can of ginger ale and set on high for 5 hours. Drain the meat pull it apart and add BBQ sauce, leave in crock pot on high for another hour. 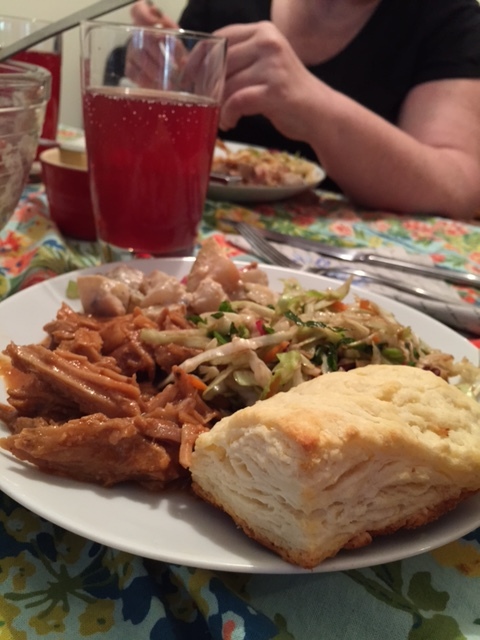 The biscuits full of gluten were a departure from my usual drop biscuits, easy and delicious. I was able to make them large enough for pulled pork sandwiches. Guest Chef prepared the coleslaw based mostly on the linked recipe above, but with a few of his adjustments that I didn’t see. We count on CTG for tasty roasts and stews with potatoes and lots of butter. A few weeks ago she mentioned that she wanted to try a new flavour. Somehow Moroccan food was discussed and CTG had a mission. It turns out her sister had always wanted to make Moroccan food too, so they discussed recipes back and forth for a week. At one point they were planning on cooking together, but transporting hot food can be difficult. 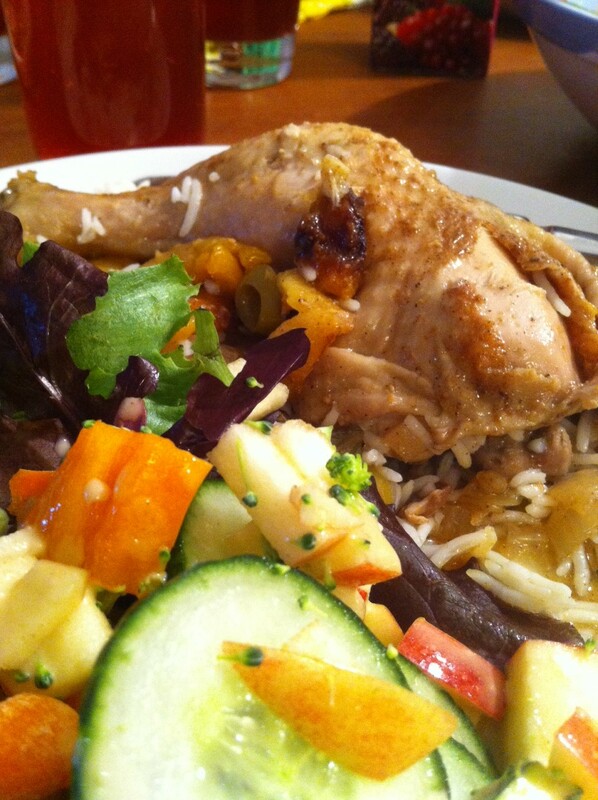 CTG made crock pot chicken that was delicious. CTG skipped the chick peas and diced the onions up very small in hopes that 6 hours in the crock pot would make them not hurt NP. Also our chicken had skin and bones. I’m pretty sure this changes the cooking time but it all turned out well in the end. 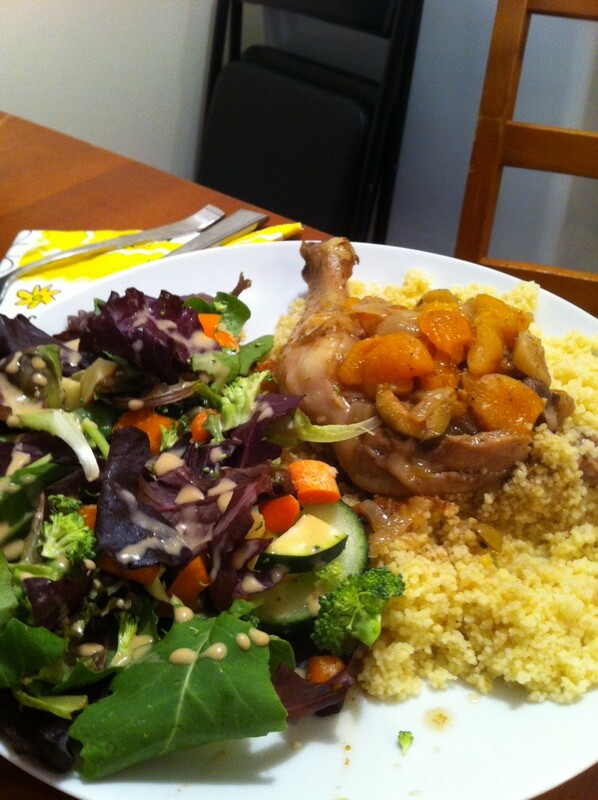 The salad was a great fresh balance to the stewed chicken and the option of cous cous (processed wheat and therefore gluten) or rice for starch was ideal. Lamb is a pretty expensive meat that I (FFB) have very little experience cooking. I have lots of experience eating it, but am always stopped by the price tag when shopping for myself. Seems a pricey bit of protein that would feel like a serious waste if you messed it up. 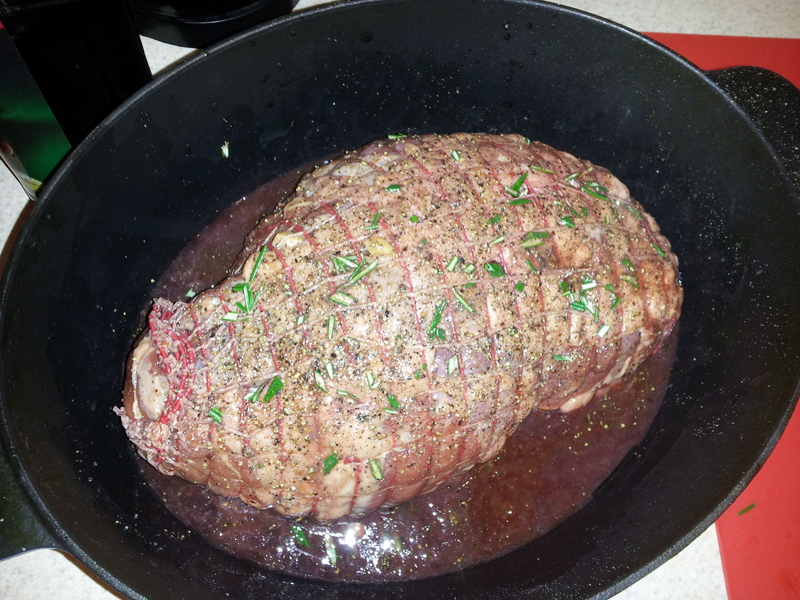 Enter Costco meat department, a brave friend and I ended up with a lovely wrapped boneless leg of lamb for roasting. Yup, our initial intention was to make a basic lamb roast. Garlic stabbed in everywhere, rosemary and oil and salt rubbed on the outside. Some old port from my cupboard to make it fancy. It all went wrong/different for 2 reasons i) we trusted the New Zealand Lamb Association website’ s chart about cooking time so much we didn’t check with the thermometer throughout the roasting process. ii) We didn’t factor in the fact we were using a lidded cast iron dutch oven which would accelerate the cooking time. When the timer let me know our calculated cooking time was over I stabbed in the meat thermometer to find we had gone well past the rare 160 degrees we were looking for. However, experimenting with new recipes is kind of how the whole Monday Night Dinner thing got started so I proceeded to let it stand while we thickened the cooking juices for a lovely dark gravy, and attempted to carve the beast. Instead if fell apart. The lamb falling apart started one of those circular conversations “Hey CTG we seem to have made pulled lamb” I would say. “That is definitely the title of this recipe’s blog post” said pretty much everyone in unison. From past years you may know that we celebrate “feast” days with what we call “orphan dinners” these are pot lucks for our extended “family” who may not have a family feast to join in the local area. Also some people like to have a few feast days if the weekend is planned out correctly. This year we went from a table of 11, to a table of 15 on feast day. It was delicious and tasty and we sent everyone home with a food baby. CTG our actual host was away for the weekend and left me (FFB) in charge of “monitoring” our Facebook event to make sure we had a balanced meal. I think I’m kind of old school when it comes to pot luck. I figure if 8 out of 10 people showing up bring pie, we are going to sample a whole lot of different desserts. So while I kept an eye on the event for numbers, I did nothing about steering menu choices. It worked out really well all on its own. 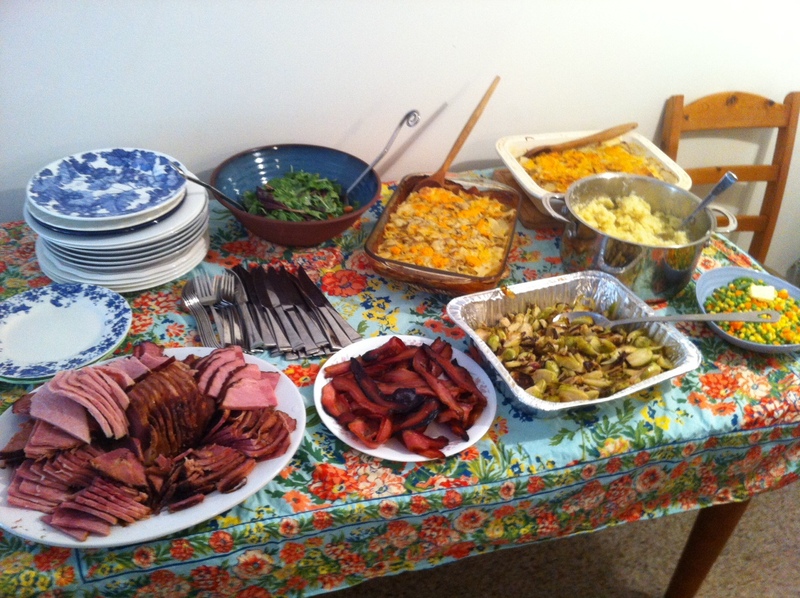 There was ham (fancy spiral cut w/black currant jelly glaze), mashed sweet potatoes, roasted brussel sproouts, 7lbs of scalloped potatoes, mixed veggies, ceasar salad, spring mix salad, apple crumble, apple pie, pumpkin pie, homemade Skor bars, chips and dip and fancy fizzy water for all. .Oh yeah and 2 lbs of fancy bacon from Red Barn. 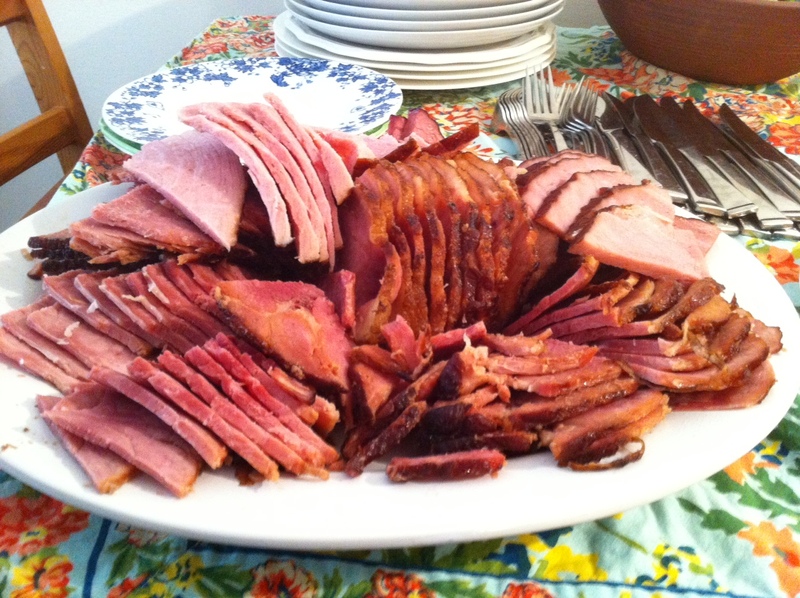 The “glaze” on the ham was really just a jar of home made black current jelly rubbed on the ham for the last 10 minutes or so.